It’s now September and here’s me wittering on about my garden activities in July. I’m so far behind with this year’s “Vegetable Diary” I was almost tempted to abandon the idea. However, as I have all the notes and photographic evidence I thought it would still prove useful to other Algarve gardeners and a reminder of my successes and failures for next July. 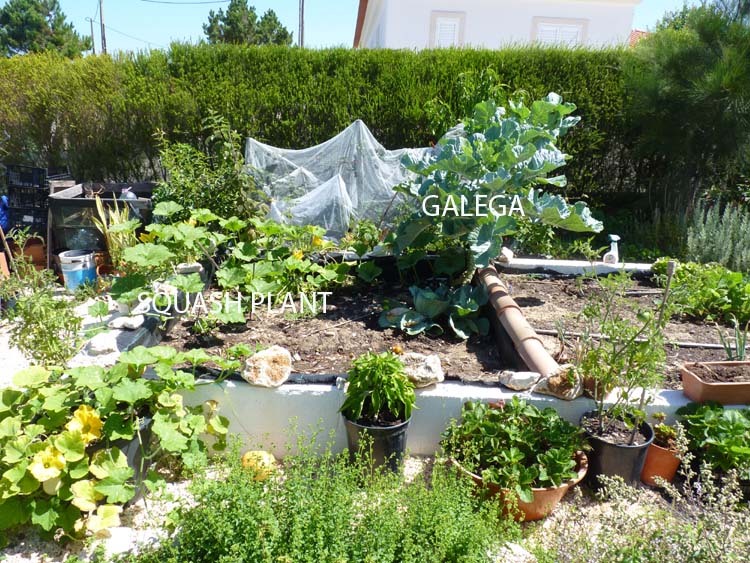 I harvested the red onions in mid July, so apart from the Galega cabbage, two white cabbage, a few lettuce and a self-seeded squash plant, which was growing, and is still growing like a triffid, the plot was empty. 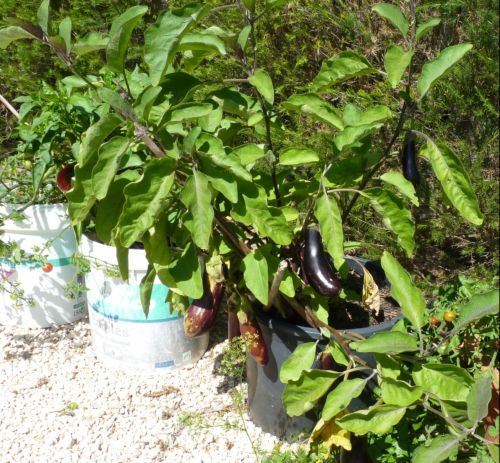 Rather than replant with peppers and salad I decided to plant these in pots to conserve water – extreme heat makes for thirsty vegetables! Another point for consideration was the cost of water as it is charged by the cubic meter. Once you exceed a certain level of usage, water is almost as expensive as wine! The red onions, I planted in December, were a great success. 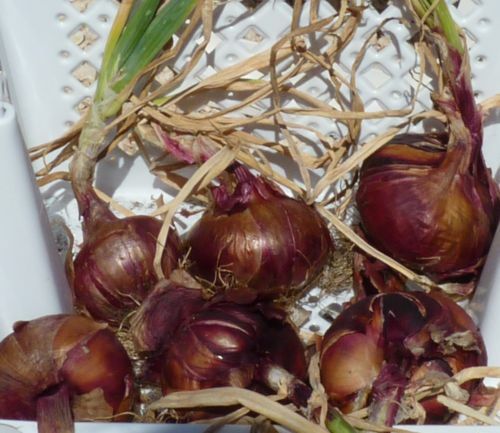 This year I will plant more onions – reds because they are expensive to buy in the shops, and normal onions because we will grow enough for Mr Piglet’s pickled and spring onions. 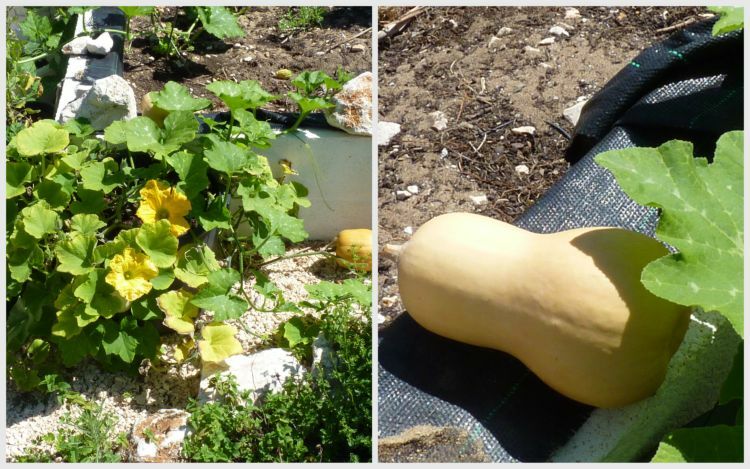 The self-seed squash plants continued to thrive and much to my surprised produced a couple of squash. I fed with liquid fertiliser once every two weeks and kept well watered. Melon plants can grow in containers! 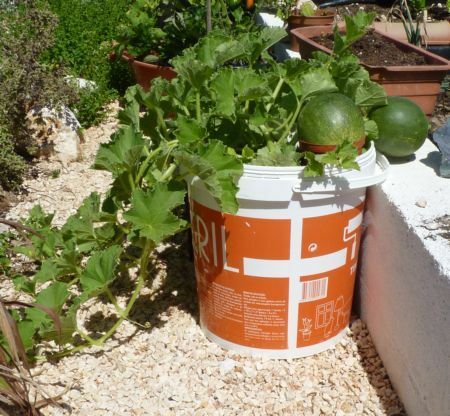 Growing melons in a large pot (or in this case a plastic paint pot) was purely experimental. They adapted well, and while several flowers failed to fruit at least I had two fairly good specimens to prove it can be done. I fed the plants fortnightly with liquid MiracleGro and kept the plants well watered. I think these were planted as plugs in late May. The cherry tomatoes were once again extremely successful. I did not attempt to stake the plants and instead just let them trail so they were more compact. I fed approximately every two weeks with liquid fertilizer and kept them well watered (not drowned). I tried other varieties such as beef and plum tomatoes but these needed stakes which proved difficult in pots. Next year, I, or should I say Mr Piglet, will create a trellis area so I can grow other varieties. They grow well in pots that’s Aubergines not snails, albeit a little slowly. I fed approximately every two weeks with MiracleGro liquid fertilizer. 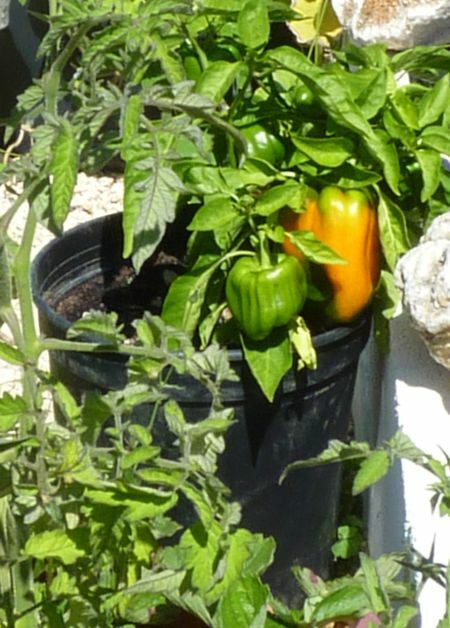 The orange pepper plant pictured below was planted as a seedling plug at the end of May. I also grew green peppers planted the end of February, and red peppers planted from April onwards. I staggered the planting dates to avoid a glut of peppers and the dreaded ‘feast then famine’. Once the first flowers had set I fed approximately every two weeks with MiracleGro liquid fertilizer. I kept the soil moist but not wet. The blackberry plant continued to bear fruit but for some reason they seemed to take a long time to ripen. If your plant is suffering from the blackberry disease known as Raspberry Bushy Dwarf virus, the leaves will be have some bright yellow on them, and the leaves of the fruiting vanes may have a bleached look in the summer. The disease known as Blackberry Calico will cause faint yellow sublotches on the leaves of the plant. I’ve quoted the above from the site, because as sure as God made little apples my blackberry plant is sure to get one of the above. 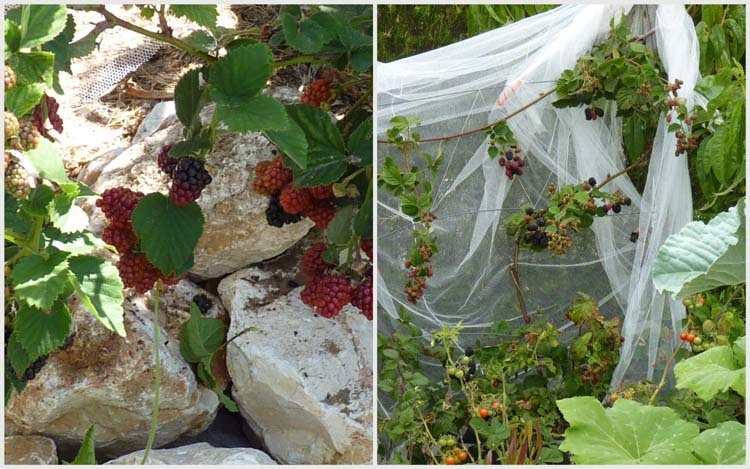 The website states blackberries need full sun and sandy soil. 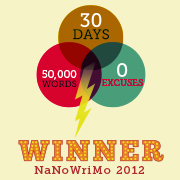 As luck would have it I can tick both of those boxes. diseases? It is early days but as they say “forewarned is forearmed”. What else grew in Piglet’s plot during July? Strawberries, cucumbers and rocket. The orange tree still had two oranges which should be ready by Christmas. The lime tree had one lime, the fig trees had no leaves and there was a partridge in our nespra tree (just kidding). Pests and diseases: Snails and caterpillars. There was very little white mould despite the high humidity. Dogs on Blue Flag Beaches – Are You “For” or “Against”? I’m glad you’re still getting fruit from your labors. 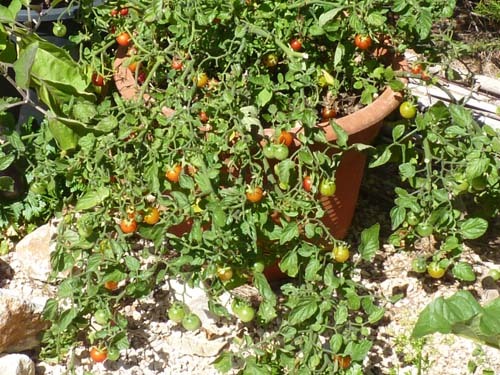 I have about 50 cherry tomatoes in a pot but they are still green – not sure they will ever turn red since it’s almost October but still Indian summer here! You are probably right. Why not try picking some, and put in a bowl with some ripe tomatoes, this should help to speed up the ripening process. Hi AD, I will certainly be planting them again next year. Laughter: your autumn and our spring temps this week are exactly the same 🙂 ! [Oh, up to 34 C by the end of the week: third one in spring!] Think you have done very well and shall be copying this and that in the next few planting weeks [should be now, but health decided differently]. Amazed by your melons ~ and my tomatoes are usually the small varieties, some branches ‘fashinably’ staked and others doing their own thing on the ground. Have to put in the smaller aubergines: get more for the pot!! Happy end of season 🙂 ! It certainly seems strange to think our summer is coming to an end, while yours is just beginning! However, most of my crops will be be going in shortly. Hope you feel better and catch up on that gardening. Shall keep all my empty paint pots for next year, what a good idea (do I need holes at the bottom?). Would like to find a disesease that would kill all the wild blackberry bushes (i.e. brambles) growing in my garden for good! They are plastic paintpots, and yes I do drill holes in the bottom and then add an inch or so of gravel for extra drainage. an abundance of growth and produce. All that hard work pays off in nourishing the body and soul as well. I love having a garden and keeping track of what works well and what doesn’t somehow helps too. Wow!. Lovely looks .. and a good growth. Nice to view those vegetables and fruits.